November 2013 – Damn, I Can Make That! Apple pie for breakfast? Sign me up! These cozy apple pie crepes are a must-have for those of us with a sweet-tooth. They’re easy to throw together on a cold morning and make the house smell heavenly. I got the original crepe recipe from my home girl Betty Crocker, but I put my own spin on the pumpkin crepe. Either works deliciously with the apples. Throw all of them together and mix until it’s a thick liquid-y texture. Bring a 6 inch skillet to medium heat, spray a little Pam and pour a thin layer of the crepe mix in. When the edge of the crepe doesn’t look so liquid-y you can flip it over. Bring each side to a golden brown and you’re done! Mix it all together and let it sit for 10-20 minutes. (This is pretty important because the first time I made these, I didn’t do this and the apples came out too dry. They need time to soak in the spices and get a little juicy.) Pour the apples in to a skillet on medium heat. Let them sit and get a little brown on the outside. 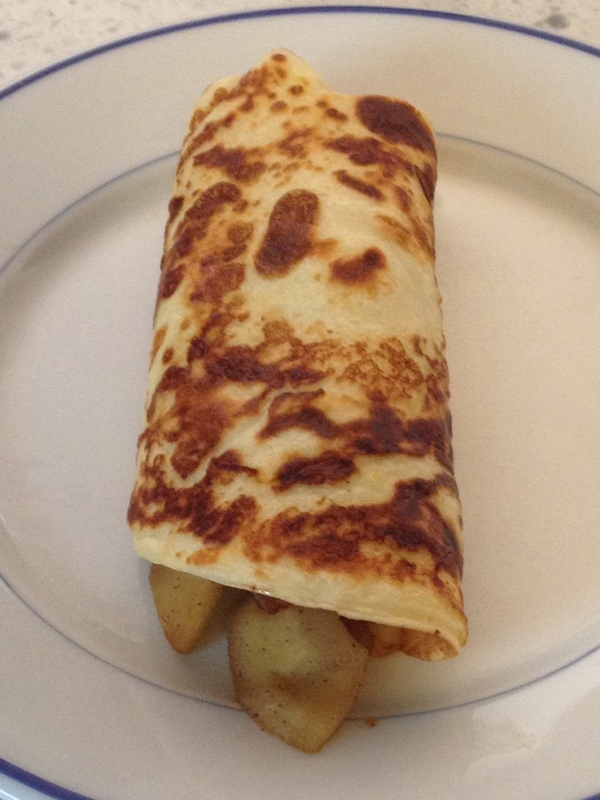 When they’re done, wrap them up in a crepe and serve. Happy Thanksgiving to all of our foodie friends and family. We can’t wait to hear all about your tasty (or even disastrous) recipes! The holidays are here and we’re officially in the giving spirit! We have two of our custom totes to give away to two lucky readers. And entering is super easy. 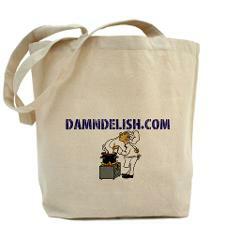 All you need to do is submit your own easy recipe to damndelish@gmail.com by Dec. 13. Not only will you be featured in our Contributor’s Corner, but we’ll also randomly select two recipes to win the totes. You’ll receive them just in time to do your big holiday shopping. And trust me, you can fit a ton of groceries in them. Pull yourself together, putting out cheese cubes is so blasé. And since cheese to wine is like peanut butter to jelly, you’ll need a grown up way to serve it with your finest goblet of vino. This recipe is an easy modern twist on a traditional brie en croute. Its fancy enough to serve for your next holiday cocktail party or simple enough to make, for the next time Jess and I open up a bottle of our favorite pinot noir. Peeled & sliced green apple (granny smith, kids). Pecans (roasted, toasted, candied, salted, whichever you have lying around). Pile & Roll per photo below & bake at 375 degrees for 11-13 minutes. 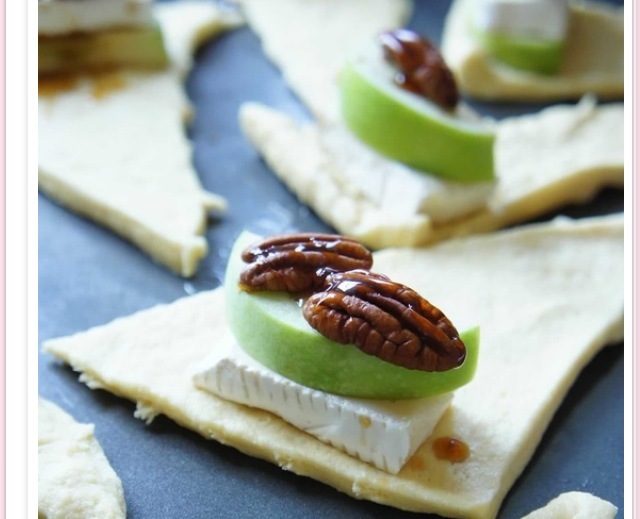 Note the crunch of the nuts, with the tart apple, with the sweet honey, and creamy brie is the perfect palette pleaser to your wine night. Best part is it compliments red or white wine which as many of you food & wine snobs know is very rare to have something accentuate both! Feel free to check out no cookin’ good lookin’ for the italian horn recipe, another yummy cocktail appetizer! So Jess is the baker out of the two of us. She dazzles at Superbowl with blue moon cupcakes or amps up new years eve with a dazzling champagne cupcakes, and I just eat. It’s not that I don’t enjoy making desserts, I just don’t have a stand mixer or other proper baking appliances, utensils, tools. So this recipe, like the pumpkin muffins or blueberry Danish, is very friendly to the non-baker, baker. Box of yellow cake mix (I know every reader from south of the Mason Dixon line just shuddered, but lets’ just say this is way easier than their method of doing cobbler & still pretty damn delish). 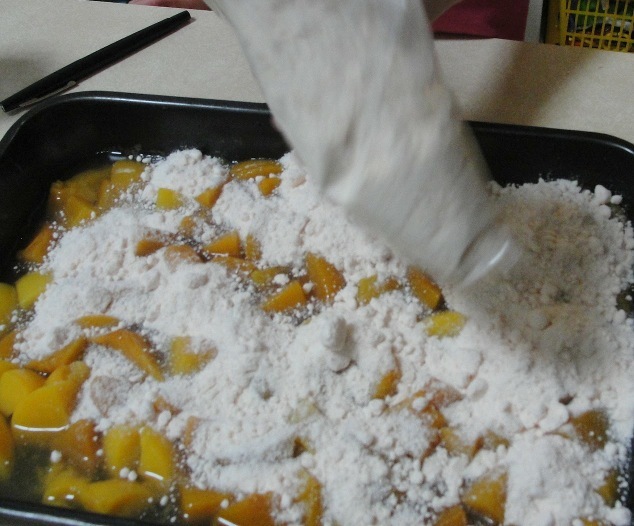 Dump the peaches (don’t drain, add with juices) in a pan and cover with cake mix (make sure to evenly distribute/coat the peaches because this will ensure even cooking and even soaking up of canned juice). Then drizzle the melted butter & sprinkle the cinnamon/brown sugar/nut mixture last on top. Serve a la mode with a scoop of your favorite vanilla ice cream or just dollop with some whipped cream to keep as a warm dessert. Check out our Instagram to see the final product! So tasty!